Whilst Data Space is primarily concerned with data storage in whatever form, we also offer a very important and secure destruction and disposal service. It is always a concern to know that your data is destroyed securely. So when you have met your legal requirements and it’s time to archive documents or other media permanently, we can help. As with all our services, our data disposal service is a complete package. 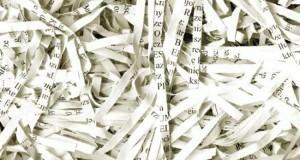 We can collect from you in secure vehicles, to take your documents off-site for destruction. Alternatively we can complete disposal on site. We have a wide range of waste containers for the disposal process from waste sacks and bins to other suitable containers. We issue you with a ‘Certificate of Destruction’ once the job is complete; complying to the most up to date Data Protection regulations. We send all destroyed information to an Environment Agency-registered recycling plant so that waste can re-enter the supply chain. Here at Data Space we like to give back to the environment too so we are involved in a Swedish project, ‘plant a tree’. We make a donation to this project for every tonne of paper that is recycled. Data Space has also developed an IT disposal service for our business customers. No need for IT departments to erase data, Data Space provide a total IT disposal solution which ensures compliance obligations are met and your protection is maintained. If you have data it is time to dispose of, contact Data Space to discuss how we can help. Keep an eye on us on Facebook, Twitter and LinkedIn!